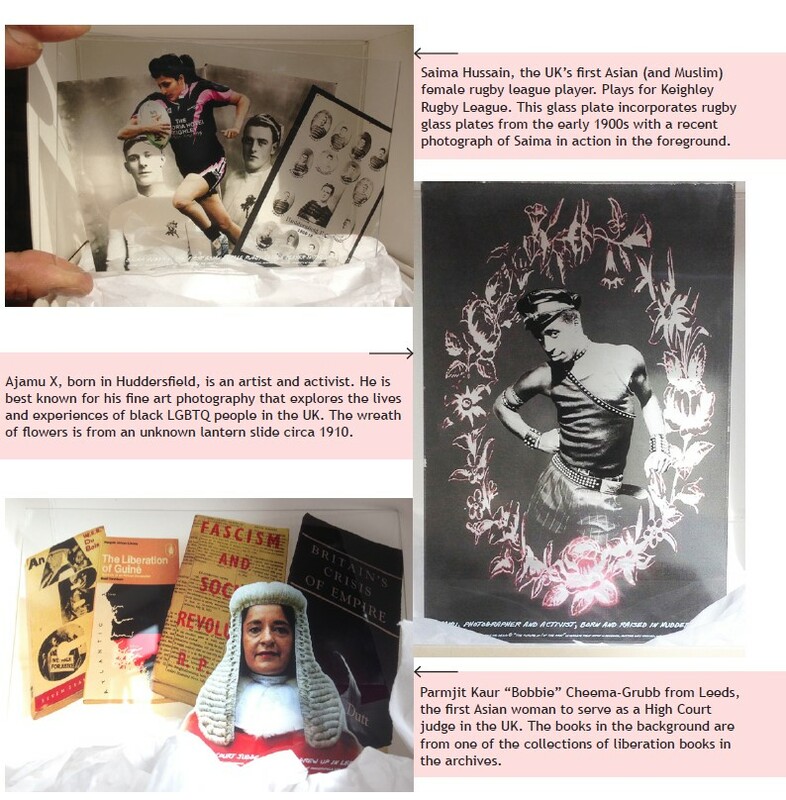 The University of Huddersfield’s Archives at Heritage Quay hosted a unique residency with multi-media artist and musician Poulomi Desai, funded through the Leverhulme Trust. For 80 days during the academic year 2016/7 Poulomi immersed herself in the heritage collections stored at Heritage Quay and in the life of the Service, its staff and users. As well as investigating the boxes which hold the archive materials and which are kept in the archive repository when not in use, she also engaged with people attending our events, the researchers pursuing their own interests in the archives, general visitors to Heritage Quay, and staff and volunteers who work here. She also made connections and visits with other artists and groups within the area, and delivered workshops including at European Researchers Night, a University-wide free event in September 2017. Poulomi produced a series of artworks based on her encounters with the people, collections and broader themes in her residency. One set of these artworks is available at Heritage Quay, the other is in London at Poulomi’s arts space Usurp; the works will be exhibited and performed further. “stories in saris” two silk sari artworks, “S360” and “SE148163” each 5770mm x 3700mm, and made to be worn. The designs are based on Poulomi’s research into three small collections held at Heritage Quay, and listening to idiosyncratic music works in the British Music Collection that reference Indian musicology. The silk was printed in the University’s textile printing department. “Memento mori” – new photographic glass plates which combine contemporary portraits with motifs from old photographic glass plates, lantern slides and book covers from the main collections of art, rugby league and literature. These celebrate people born in Yorkshire who have broken conventions and challenged prejudices. “Unmuted” – a film which contrasts the location of Heritage Quay and its collections with the local landscape of the Yorkshire moors. Performance pieces – two pieces, one for the Archives Assistants in Heritage Quay and the other for anyone handling “Made in Huddersfield” (see below). Both pieces enact rituals of opening, uncovering and displaying the contents of the box – the artworks created during the residency. 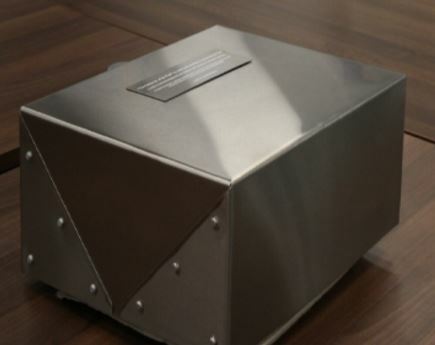 “Made in Huddersfield” – a version of the standard archive storage box created in stainless steel and produced by local firm Morley Brothers. These boxes, made of archival quality acid-free cardboard with non-corroding brass fastenings, are used throughout the repositories in Heritage Quay for the preservation and easy handling of the collections. The stainless steel, riveted, version contains and preserves Poulomi’s artworks created through the residency (listed above), and also is central to one of the performance pieces. Poulomi describes her time in Heritage Quay as providing “unexpected and surprising opportunities” artistically. For the team of staff and volunteers at Heritage Quay, as well as our researchers (both from the University and not) and visitors, Poulomi’s responses to the collections give insights in the past but also reflect on how our management and research processes determine the future. For more information on the residency, please see www.usurp.org.uk/project/leverhulme. Our thanks to the Leverhulme Trust for their generous support of the residency.